In marketing process, there is a need to understand why customer or buyer purchases goods and services. Current literature associated with industrial buyer behaviour that has tended to focus on modelling and mapping the industrial buyer behaviour (Parkinsson and Baker, 1986). Though, limited research has been found on how the industrial buyer performs when faced with a drastic product innovation. Buyer behaviour is associated with the operations and decision processes involved to select between alternatives, procuring and using products or services. It is occasionally suggested that buyer behaviour is only of interest to marketers because they desire to influence and change it. Such a statement consistently raises the matter as to whether marketing is a moral profession. Industrial buyer behaviour is in quintessence of understanding of how industrial organizations purchase products and services (Dwyer and Tanner, 2001). It is also identified as organizational buying process or business buying process. This field is essential to comprehend customer's needs. It is imperative to be conscious of the differences between consumer buying and industrial buying because the industrial buyer behaviour varies from consumer buying in many facets such as using more variables and greater difficulty to identify process participants (Moriarty, 1984). Parkinsson and Baker (1986) explained as the buy of a product which is made to please the entire organization instead of satisfying just one individual. Industrial buying behaviour is a basic concept when evaluates buyer behaviour in all types of organizations. Also, in industrial buying situations there is an insight of greater use of marketing information, greater exploratory objective in information collection and greater formalization (Deshpande and Zaltman, 1987). Process of the industrial market is totally different because the forces of market influence industrial demand. The executives of industrial market must respond in a dissimilar way to modify the markets, develop products to accommodate in changing nature of market and sell them in completely different ways to the target and new customers while retaining corporate policies. Therefore, industrial marketers face many distinct marketing situations not normally encountered in the consumer market. Additionally, the industrial market is dynamic and challenging in any nation's monetary growth and development. It is important to understand the reason of buying in market. Parkinsson & Baker (1986) construed that the industrial buying is the buy of a product which is made to satisfy the entire organization instead of satisfying just one individual. Industrial buying behaviour is considered as being a basic concept when investigating buyer behaviour in organizations. In industrial buying situations, there is an awareness of greater use of marketing information, bigger exploratory objective in information collection and greater formalization (Deshpande and Zaltman, 1987). In industrial marketing, the buying process is more complex in comparison to consumer marketing. The buying decisions in industrial marketing are based on numerous factors that include compliance with product specifications product quality, availability, timely supply, acceptable payment and other commercial terms cost efficacy, after-sales service rather than on social and psychological wants. The buying decisions usually take more time and engage many individuals from technical, commercial, and finance departments. After the initial offer made by a retailer, there are negotiations and exchange of information between the experts and representatives from both the purchaser and the seller organisations. Therefore, inter-organisational contacts take place and interpersonal relationships are developed. The relationships between the sellers and consumer are highly valued and they become stable in the long run because of a high level of interdependence. Webster and Wind asserted that factors that influence industrial buyer behaviour can be structured in to two variables such as tasks and non-tasks. 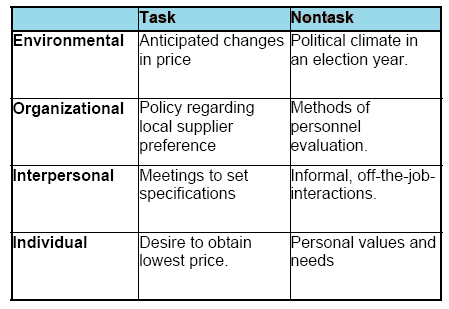 Tasks are directly associated with buying problems whereas non-tasks variable include the aspects beyond the particular buying issues. The common model of Webster and Wind has been disapproved on the basis that it is not always possible to categorize a given set of variables as completely task and non-task. Rather any given set of variables will tend to have task and non-task dimensions (Agbonifoh, et al., 2007). Another model which explained the industrial buying behaviour is The Robinson, Faris and Wind model. It is considered to be one of the earliest and most extensively used models to describe organizational buyer behaviour differences (Agbonifoh, et al., 2007). The model puts forwards that the industrial buying process is a succession of stages which may vary depending on which buying situation (called classes) the particular buying firm is confronted with. The model analyses organizational buying behaviour as depending on the amount of experience the buyer has with product class, the amount of information sought and the time spent on the decision. A cross-tabulation of the phases with the buy classes result in a buy-Grid-framework. The general buying decision which comprises of the decision to begin a project. It may contain the establishment of a new building, or new product. The actual buying decision which include selection of a definite project, including the objectives, and project specifications. The decision which is associated with the most suitable suppliers/vendors and products. The technical buying decision which engages decisions linked to the actual mechanics of transportation, drawing up of contracts, final price and payment negotiations and the stipulation of other feature. Other influential model is The Hobbesian organizational buyer model formulated by Thomas Hobbes. The assumption of this model is that the purchasing officer's interest to do his best for the organization is obstructed by his interest to do the best for himself that at any given time the organizational buyer pursues both personal and group goals. The Hobbesian model evidently describes why an organizational buyer may utilize a vendor offering a higher price or slightly less quality instead of a seller offering a lower price for the same value. 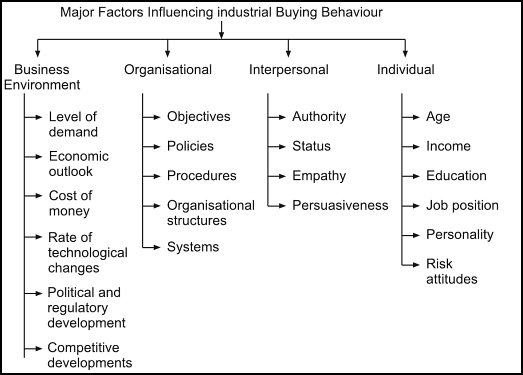 Johnston and Lewin (1996) demonstrate that extensive researches conducted consolidated the existence and significance of three important dimensions when analysing industrial buyer behaviour. How the buyer decision process looks like when organizations stands in front of different buying situations. The different criterion's used by industrial buyers when buying a product/service. Marketers gain Industrial marketing efficacy through deep understanding the nature of industrial buying as well as comprehending the industrial buying behaviour. Industrial buying behaviour is a complex procedure which cannot be explained by single descriptive variable such as price, total cost, reciprocity, or ego enhancement. Any rationally complete model of industrial buying behaviour must be able to deal with the intricacy of industrial buying decisions which involve many people (users, deciders, influencers and buyers) are technical in nature, are made over long periods of time, and need multifaceted interaction of personal, interpersonal, organizational and environmental factors to determine buyer response to marketing effort. Numerous scholars explain the industrial buying behaviour with different models that they have developed; which include the technical aspects and psychological aspects of many individuals (Webster & Wind 1972). 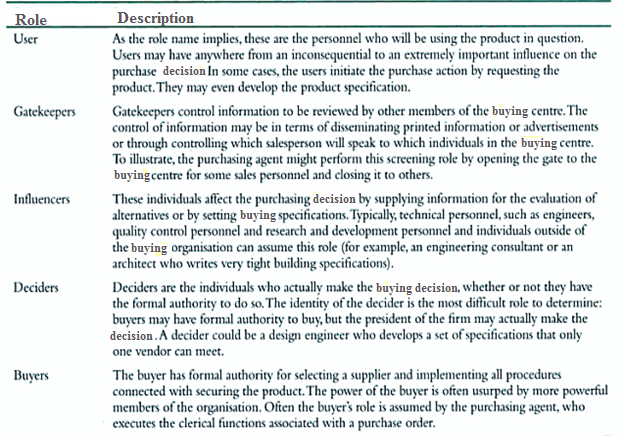 Webster (1965) stated that in studying the industrial buying process, it is necessary to understand both industrial and individual feature of decision making. The psychological world of the individual engrossed in organizational buying. This characteristic recognizes that purchase decision in an organization is not made by a single individual, but by members of different departments and that the psychological make-up of the decision makers is critical (Iruka, 2001). The condition which precipitates joint decision making. Not all decisions are made together. The model gives six factors which establish whether a specific buying decision will be joint or autonomous. Three of these factors are related to the characteristics of the product or service and the other three are related to the characteristics of the buyer organization. 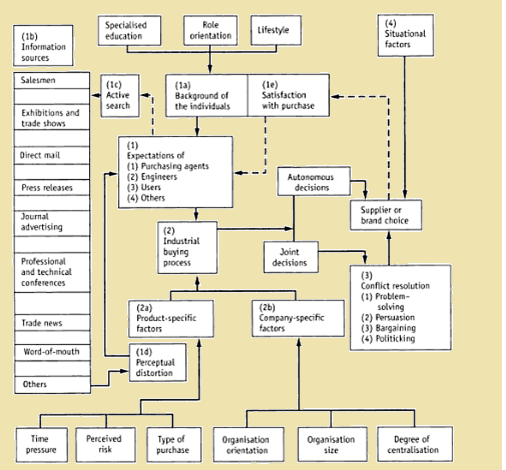 The Process of Joint Decision Making: The Sheth interactive model delineated the process of joint decision making to include the following steps: (a) Initiation of the decision to buy; (b) Gathering of information; (c) Evaluation of alternative suppliers, and (d) Resolution of conflict among the parties who must jointly decide. 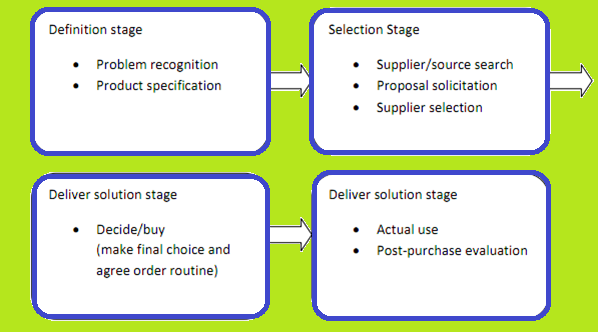 Hill and Hiller model reproduced to analyse the purchase decision from the viewpoint of buyer and consists of three major constituents such as usage of purchased items, reason for purchase and purchase complexity. The intended use of proposed purchase is considered as vital information to the vendor because it will indicate the technical content involved, the value and essentiality of the item, and the degree of risk involved, the likely timing of purchase and whether the product is likely to be buyer or supplier specified. Hill and Hiller proposed five main categories of use. For incorporation of production output which may be to order or to stock. For utilization during production processes but not incorporated in the product. To provide production facility in manufacture, service or resale. For use in maintenance operation. For use in development and engineering work. The buying situation: The buying situations are developed when employees in an organization face a problem. This occurs when a disparity between the required outcome and the actual situation can be solved through some buying action the process of resolving the problem is considered as a buying procedure. All the activities executed by the individuals in an organization in a buying situation are incorporated in industrial buying behaviour. These are identifying, evaluating and choosing among various different suppliers. All members involved and affected in this process are member of the buying centre. There are different types of buying situations. The concept is that for a given buyer, while purchasing the same product, individual buying pattern and buying process will be different. It is established that the comparative importance of attributes when selecting a certain supplier changes depending on the different buying situations. Three buying situations were recognized that include new task, modified rebuy and straight rebuy. New Task: In this type of buying situation, either an internal stimulus or an environmental factor causes this recognition that lead to explore a new task product. The problem is new from the standpoint of the buying influence and is also new compared from other problems in the past. Generally, this situation occurs relatively occasionally. It can be said that a new task situation elucidates the need that has not faced by the organization before. Task of that level may necessitate thorough analysis of suppliers so that organization will search for many sources of information and support, utilizing the complete buying process to scrutinize alternatives. Straight Rebuy: This buying situation is usual and has established solutions. Straight rebuys involve basically the reorder of a previous product (Kovalev 2003). In any rebuy situation, buyer has much significant experience. Straight rebuy is the most widespread situation in industrial purchasing. The solution to the problem is same as it was in the past. Since the industry has got experience, the solution becomes routine. There is a likelihood that the quantity of product changes time to time and still it is considered as a straight rebuy. Purchasing obtains information from inventory control department to reorder the material or item and looks for quotations from suppliers in an approved list. This situation usually needs maintenance of product and service quality from suppliers and extreme effort for vendors, who are willing to be in approved list. Modified Rebuy: This buying situation is different from the straight rebuy because in this situation new alternatives of supplier are considered. Modified rebuy usually happen when there is a change in selection criteria or buyer plans to reassess some product specifications, terms of delivery, price, contract details or even supplier. It involves fewer people and time than the new task situation and more people and time than straight rebuy. In this situation in-suppliers try to satisfy the buyer and keep their position in approved list while out-suppliers get a chance to offer their service a change in the buying organizations requirements (Kovalev 2003). Buying centre: The concept of buying centre was first originated by Robinson, et, al. It entails to all those members being a part of buying process. The main feature of industrial buying is a group activity. Usually people from various areas of business and of different status contribute to the final purchase decision. Group of individuals with a stake in the buying decision is called buying centre (Anderson, 2009). Kozulya (2010) affirmed that developing relationship with buying centre defines the victory of partnership between marketers and corporate customers in general. There are four vital things for the sellers to realize: (i) Who are the members of buying centre? (ii) What kind of decisions are they responsible for? (iii) What influence degree they obtain? (iv) What assessment criteria they use? 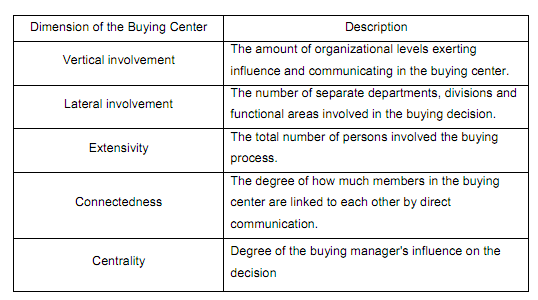 Johnston and Bonoma (1981) developed five structural and interactive dimensions of the buying centre that can be specified and determined. Members of buying centre find out the organization's needs and methods the organization uses to satisfy them. Buying centre's complexity depends on the importance and intricacy of the need. Buying centre is not exactly one certain location where decisions are made. The concept of buying centre is described as the representatives of different independently operating parts of organization such as finance, production, purchasing, engineering, human resource and etc. In large and complex organizations, influencers (members of buying centre) may be physically located at a great distance from each other (Vitale et al., 2010). Main objectives for business marketers are to recognize the major influencers of the buying centre, the roles of these individuals and factors that affect their decisions. Other important feature of buying centre is psychology and enthusiasm of its members. Even though business to business customer's decisions are based on organizational needs and professional opinions, they are also under strong influence of individual roles, social positions and self-perception. Business marketers should consider that for every business decision, people with their own quality and psychology (Kozulya 2010). Environment Influences: Webster and Wind model (1972) stated that environmental influences have effect in buying. Business buyers are greatly influenced by factors in the current and expected monetary environment. These factors are put forth by numerous institutions and business firms (suppliers, competitors and customers), government, trade unions, political parties, trade associations and professional groups. The form of these institutions differs in different countries, and such differences are critical for establishing relationships with foreign company (Kotler 1997). Environmental influences describe the accessibility of goods and services and common business conditions, facing the buying organization including the rate of financial growth, the level of national income, interest and technological rates and unemployment. Economic and political factors are the most powerful factors on general business conditions. Business buyers are also impacted by regulatory factors and changes in political situation. Management experts recommend that Business marketers must observe environmental factors, recognize the institutions that exerts influence, verify how they affect buyers and try to turn problems into opportunities. Vigilant analyses of environment are mainly important for entering new markets. Organizational Influences: Individual decision makers respond in a different way in industrial buying decision due to the influences they receive there. Organizational environment is a direct surrounding that person faces during his work such as office colleagues, work place, size of the organization, its orientation, market position, vertical or horizontal management involvement, organizational structure, wage system and system of social guards, work conditions, employment relationship, organizational philosophy, rules of conduct and internal order, degree of risk aversion present in the culture. In organization, people must interact as group members. Person is not only an individual but a chain in a system and this way of things should not be underestimated (Webster and Wind, 1996). Webster and Wind (1997) believe that organizational factors cause individual decision makers to proceed differently than they would if they were functioning alone or in a dissimilar organization. Organizational and buying behaviour is stimulated and directed by the organization's goals and controlled by its financial, technological and human resource. These are three variables characterize the individual role set. A knowledge of each of these dimensions is necessary for the business marketer. In the process of buying decision, three classes of variables must be recognized. The first one is that to distinguish different roles between the buying centre members. Next is the variables performed for interaction among individuals in the buying centre. Lastly, identification of the dimension that makes the group functioning. Sheth presented an explanation of decision making that is made jointly between individuals in the buying centre. It starts with the start of decision to buy, which is followed by collecting essential information, investigating and evaluating available alternative suppliers and negotiation between the parties to mutually make a decision. Sheth stated that there are mainly three departments whose members are connected to the different stages in the buying process. The most common are employees from the purchasing, manufacturing departments and quality control departments. There are significant interactions between the persons in the three departments and they are often taking combined decisions. Therefore it is imperative for an industrial dealer to scrutinize similarities and differences in the psychological world of these persons. It is established in literature that interpersonal communications has important role in decision making process within the buying centre. For business marketer understanding of power distribution and authority patterns may be a clue for influencing member's decisions and developing healthy relationships with them. Personal Factors- The foundation of all industrial buying behaviour is the individual behaviour (Webster and Wind, 1972). The individuals in an organization are the one really analysing, deciding and acting to execute the purchase either in groups or alone. Webster and Wind (1996) considered that only individual as an individual or as a member of a group can describe and analyse buying situations, decide and act. Each member of the buying process has personal motivations, perceptions and preferences. These are influenced by member's age, income, education, job position, personality, attitudes toward risks and culture. The attributes from industrial buyers will influence their response to the situation and marketing actions towards them from a seller. Major characteristics are personality; motivation, perceived role set, reception skills and learning. The individual determinants and strategies that buyers most likely use should be considered by a marketer or prospective vendor, if they wish to affect an individual industrial buyer. Sheth explicated that the background of individuals is the most noteworthy factor to each of the persons involved in the buying process. Various demographical, social, educational and life style backgrounds create dissimilar goals and values between purchasing agents, engineers and managers. Information sources and active source includes the sources of information each person is exposed to and how much they contribute to the information search. Additional Influences (Situational): Thomas and Wind (1980) explained other factor that influences industrial buying behaviour. Inter-organizational factors are regarded as the relationships between the buying and selling organizations. The industries marketing variables such as positioning, price or distribution and the marketing schemes of the rivals are also important influences on industrial buying behaviour. Sheth (1973) stated that some of the organizational buying decisions are assessed by situational factors and not by any systematic decision making process. It can be said that the industrial buyers often decide on factors other than rational or practical criteria. Industrial buyer's decision process: Industrial purchasing decision making involves more physical and observable stages. The process of organizational buying and decision making is presented by Kotler (1997) and Vitale et al. (2010). In the first phase that is recognition of problem, the buying process starts when person in organization identifies problem or need that can be met by obtaining goods and services. The buying centre examines their organizational needs and search for options that are available to address those needs. The definition stage includes several activities such as recognizing and defining the organizational problem, defining the outlines of the solution and specifying product or service that can satisfy organizational needs (Webster & Wind 1996). Phase two include description of need which involves determination of traits and quantities needed. The common attributes include reliability, durability and price. Activities in this stage are searching of potential suppliers, proposal solicitation, and evaluation of offers and finally selection of most appropriate supplier. It must be established that in case of straight rebuy, organization will probably decide the same supplier (resort, travel agency), even if it is not the cheapest one, but because of the awareness of service and safety. However, in a new-task situation, the company is willing to seek carefully, considering both financial and service factors (Vitale et al., 2010). Phase three is product specification or delivery solution stage which is obtaining the inputs from previous stage. The buying organization has to develop the technical specification of the required products. In this stage product is divided into two items. The specification about product and items are listed. Phase four is supplier search among the potential sources. The marketers have to ensure that the supplier is in the list of potential suppliers. In fifth phase of Proposal solicitation, the list of capable supplier is shortened on the basis of critical factors. After that purchasing department ask for proposals sent by each supplier. After evaluation, some companies are invited to give presentation. Proposal must include all specification such as price, delivery period, charges and taxes. Phase six consist of supplier selection. Each of the supplier's presentation is rated as per definite evaluation model. Buying organizations try to negotiate with chosen supplier for reasonable price and terms and conditions for final selection. Various parameters such as reliability, delivery, flexibility, price and services are considered for supplier selection. In order to routine specification, the buyer negotiates the final order, listing the technical specification; the quantity needed and expected time of delivery. To summarize, Industrial buying behaviour is an intricate practice which involve many persons, multiple goals and potentially incompatible decision criteria. This process denotes to the purchase and use behaviour of industrial/business goods users as well as the thoughts and decision process which take place before, during and after product buying. Thorough understanding the organizational buying process is main requirement for the development of business marketing strategy. 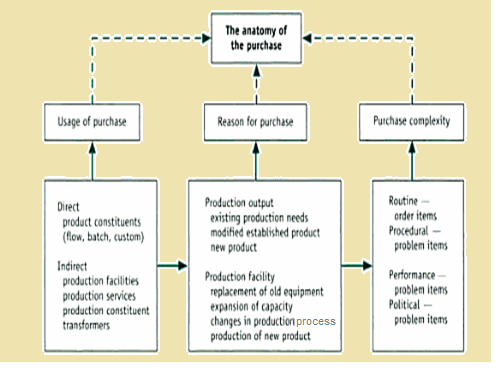 Different models are developed to explain the notion of industrial buying behaviour. Industrial buyers are more expected to purchase products directly from suppliers or manufacturers and in larger quantities, than consumers. Buying decisions of a consumer market is simple where it purely depends on the wish of consumer.